What Is Affiliate Marketing and How Can It Increase Online Course Sales? Wouldn’t it be great if others were spreading the word about your course on their social accounts? That’s exactly what you get with affiliate marketing, learn how. Eating macarons, reading a good book, binging on the latest Netflix phenomena: all of these are preferable activities to staring at expense reports first thing in the morning. But for most of us, that’s just not a viable reality. At least, not without passive income. Passive income is the dream: it’s money that moves even when you don’t, allowing you to continue making a living without cutting into your macaron-eating time. And if you’ve decided to sell online courses, you’re already on the right track. Once you’ve put your courses out there, your income is only as limited as your willingness to market. What if the onus wasn’t entirely on you, though? What if you could grow your passive income and let someone else do the legwork behind generating leads? For that, you need affiliate marketing. Here’s the lowdown of how it works and how you can use it. Sometimes referred to as “performance marketing,” affiliate marketing is a business model in which advertisers pay publishers, also known as affiliates, a percentage of every sale the publisher makes on behalf of the advertiser. Because affiliate marketing is based on performance, affiliates only receive payoffs from sales that go through and often get tracked through cookies or special links. Affiliate marketing is highly scalable, making it ideal for new or small businesses who need to keep their advertising spend to a minimum. You only pay affiliates for the customers you receive, so you’re never fronting money without results. And since the publisher is responsible for wrangling the sale in the first place, it’s the ultimate addition to a passive income stream. All you have to do is create a course, set up your affiliate program, and wait for the sales to tick in. As if that isn’t enough reason to choose affiliate marketing over paid promotions, there’s also this: unlike paid advertisements, affiliate ads aren’t usually flagged by ad-blockers. That’s a big plus when you consider that roughly 40% of internet users use ad-blockers and have saturated the markets in almost every corner of the globe. 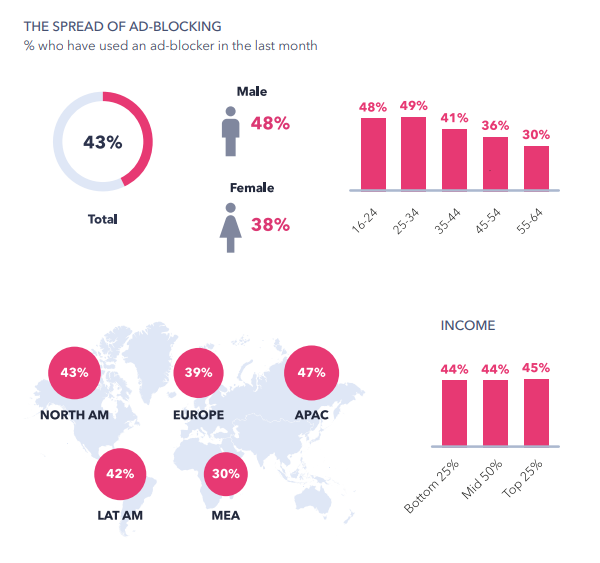 Although the recent addition of a native ad-blocker to Google Chrome is anticipated to cause a decline in the use of third-party ad-blockers, they continue to be popular today, and any potential drop-off is still a ways away. 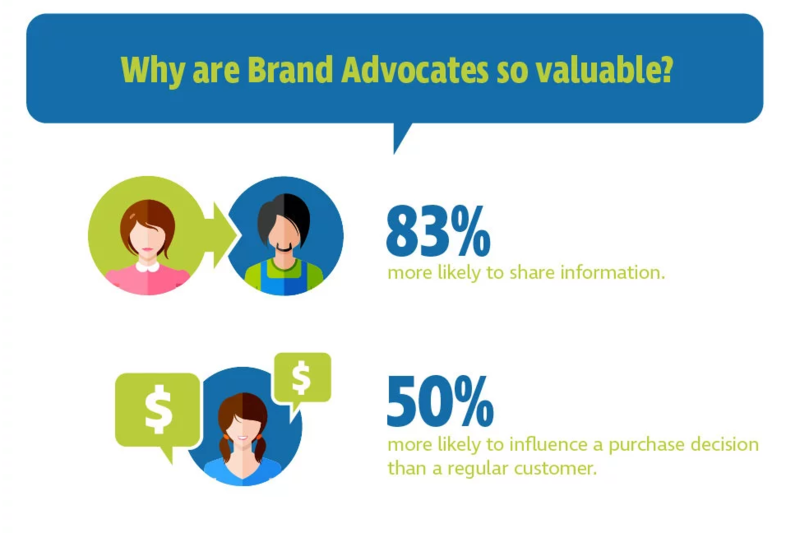 Finally, there’s also the fact that 81% of brands have an affiliate program. So if you’re not making good on affiliate marketing, there’s a good chance that your competitor is -- if they aren’t already. Pat Flynn of Smart Passive Income makes a significant source of his passive income from affiliate marketing, too. Which is probably related to why he has three times as many referring domains as he has pages indexed on Google. Not all affiliate programs are your standard click-and-buy, either. 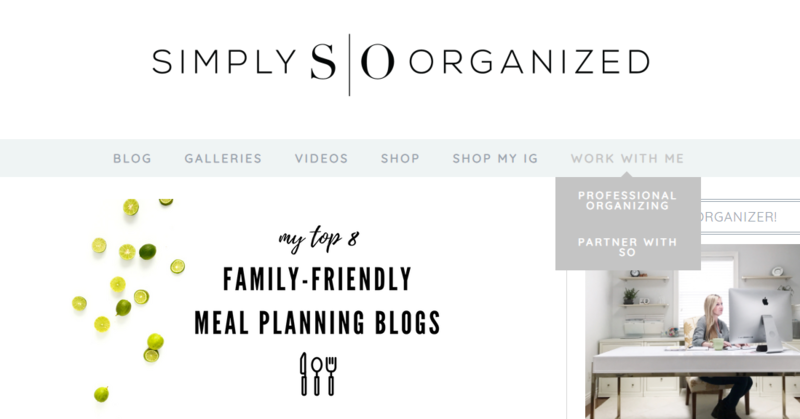 One website, which specializes in showing users the most outlandish products on the internet, pulls in over $20,000 a month through its affiliate partnerships. The majority of the products on This Is Why I’m Broke probably (hopefully) won’t be purchased, but the ones that are clearly make enough bank to keep this delightfully weird haven of the internet alive. So, affiliate marketing is definitely a lucrative potential for those who want to sell more products while doing less work, but just how easy is it to set up? How do I set up or join an affiliate marketing network? An affiliate marketing network is a third-party platform where merchants and affiliates can link up. These platforms usually include all of the tracking and payment tools you need to manage your affiliate program. 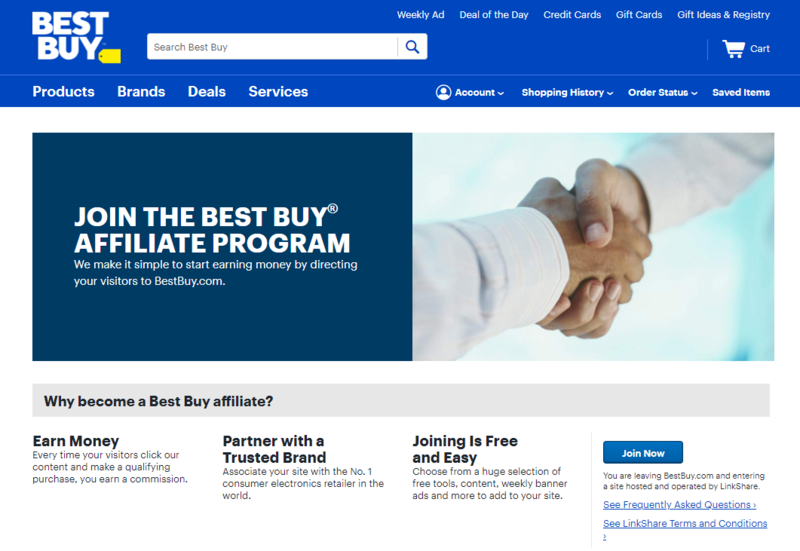 Rakuten Marketing is one of the most popular and industry-beloved examples, backing retailer affiliate programs like Best Buy. 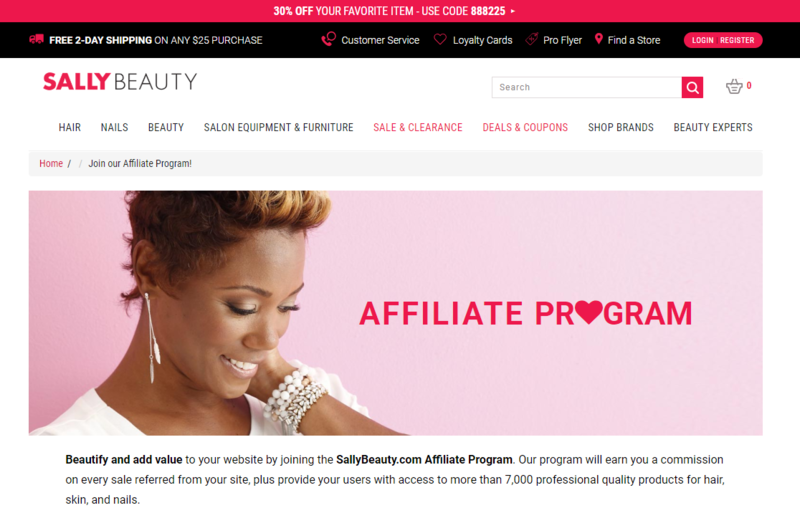 ShareASale is another mega-network for retailers, backing up partners like Sally Beauty. This is the easiest, albeit far more expensive, option for a course creator wanting to get into affiliate marketing. By joining a network, it takes the burden of finding affiliates off of you, but this comes at a price. The first is the set-up fee -- some have it, some don’t, some are as high as $5,000 -- and the other is the loss of control. When you join a network, you agree to follow the network’s policies (whether you like them or not), and they could nix your SEO benefits from affiliates if the network uses a redirect link to track its sales. What’s your alternative, then? The DIY approach, of course. But before we go any further, let’s clarify what we mean by conversion rates in affiliate marketing. Since affiliate marketing works on performance, the total orders -- not just referrals -- is a critical part of the conversion equation. With that in mind, setting up and managing your own affiliate program is easier than you might think. You start by deciding how much of a sale you want to kick back to your affiliate. It needs to be worth their time to make the sale, but it can’t cut so deep into your profits that it’s unsustainable for your business, as online educator Paul Jarvis discovered. 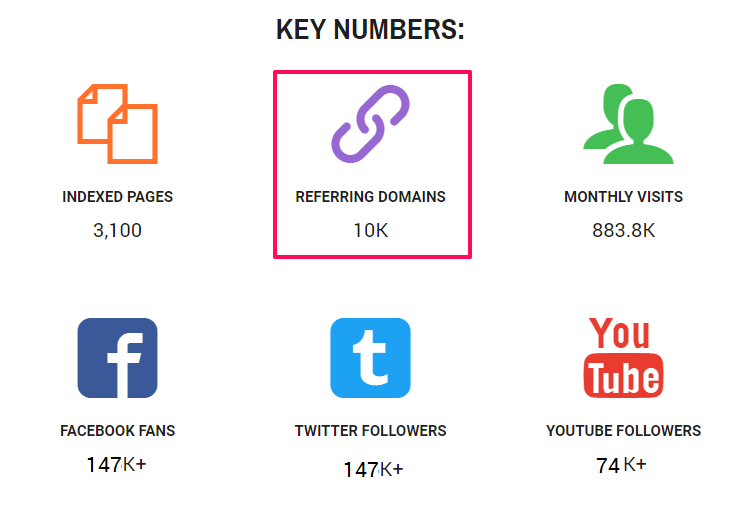 Your competitors’ affiliate rates. How much are they offering affiliates? Offer more. Your gross profit margin. Your commission rate for affiliates can’t exceed this. 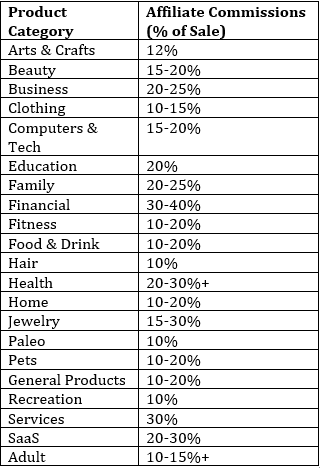 New customer acquisition rates. 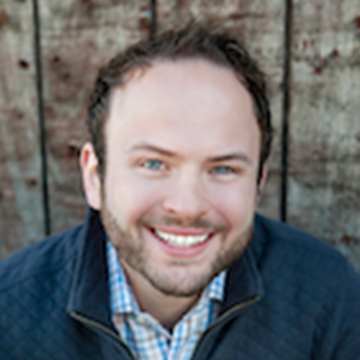 You should be offering a comparable rate for affiliates when they give you a new customer. The last point may not be necessary, but it’s a good practice. 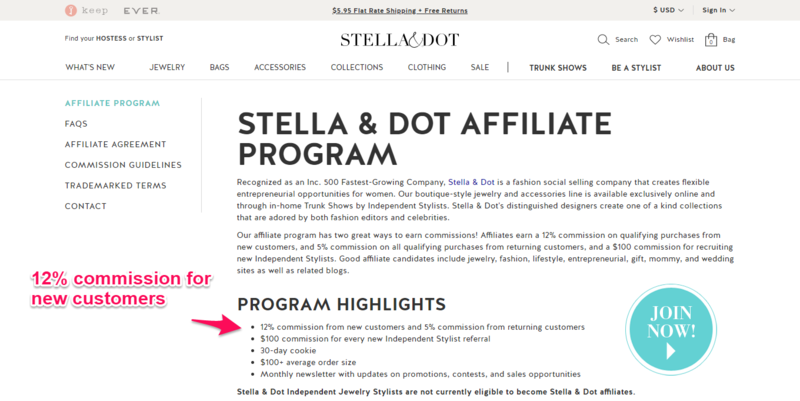 You can see it in effect here in Stella & Dot’s affiliate program. This extra mile for their affiliates is probably what’s helped the brand cultivate such resounding success from their program, generating over 18,000 engagements through their ambassador program in just seven weeks. Think Stella & Dot’s terms sound nice? 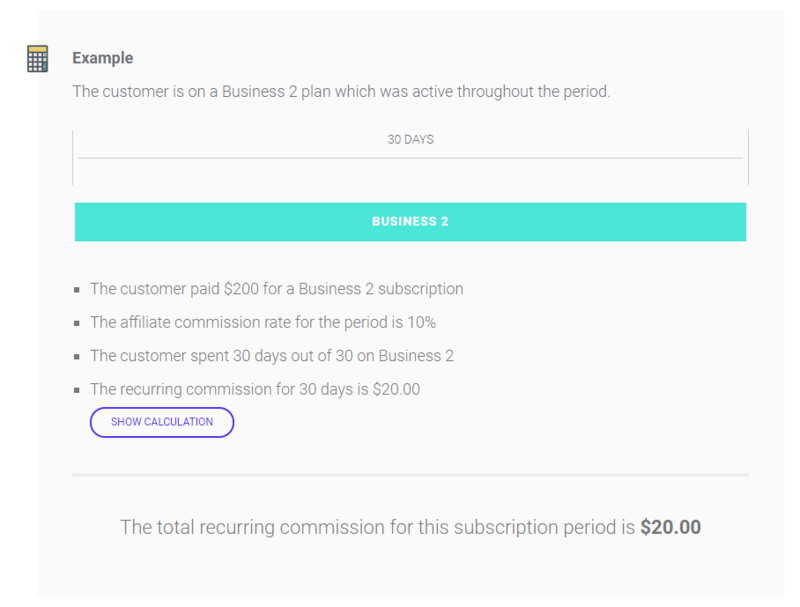 Kinsta, a WordPress hosting company, offers recurring rates for its affiliates for every customer that’s signed up for their service at 10% of the value. 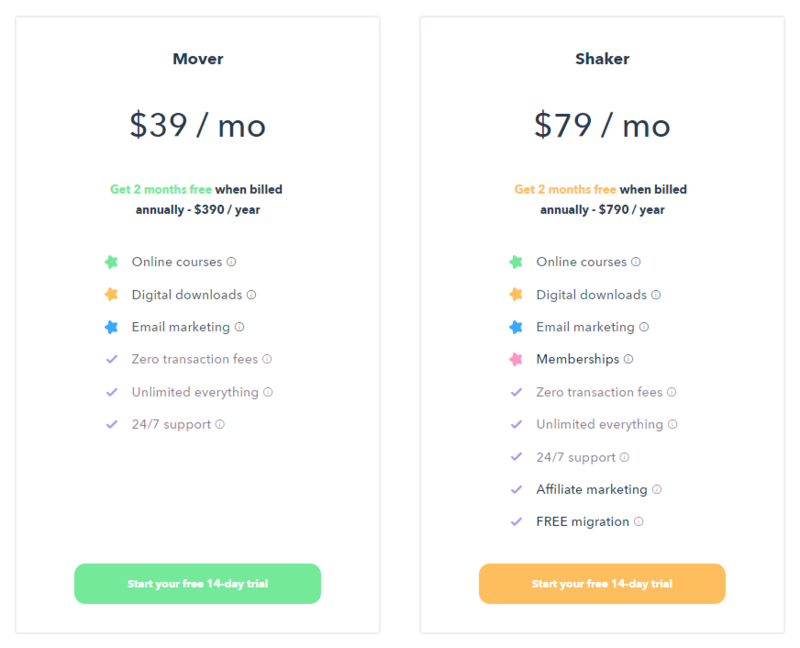 ConvertKit, one of our email marketing integrations, offers an even more lucrative rate, providing affiliates a 30% lifetime commission -- so for every month one of the referred customers uses their services, their affiliates earn back 30% of that sale. Which just goes to show that although higher commission rates cut into more of your profits, they can benefit businesses of any size. 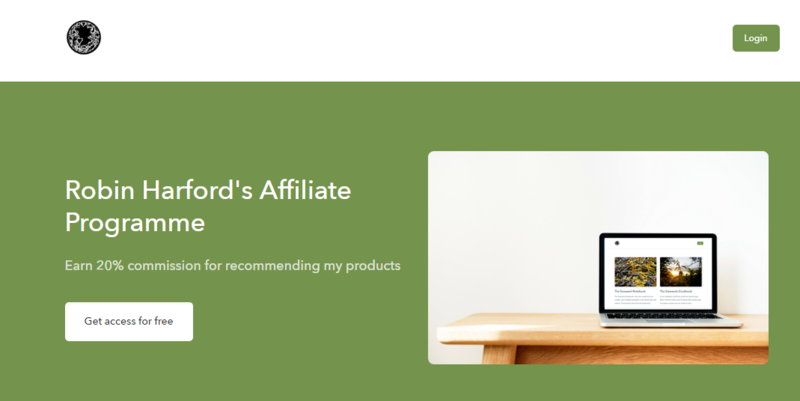 Here are some tools you can use to set up an affiliate program on your website. 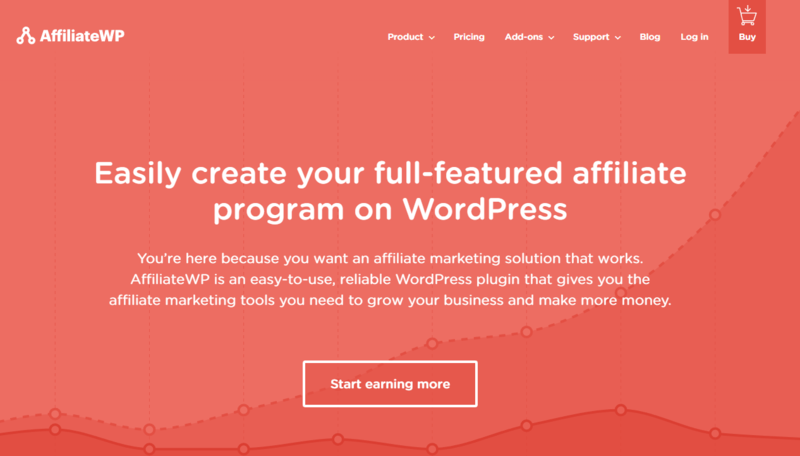 For WordPress users, AffiliateWP is an intuitive, easy plugin that lets you set the terms of your affiliate program and provide unlimited visuals for (also unlimited) affiliates directly from your WordPress dashboard. Offering direct social sharing, customizable email templates, and the ability to set up recurring or single commission rates, Tapfiliate is another affiliate platform that integrates with a variety of website platforms. Wix users will especially enjoy the ease of install and customized guides. We’re big fans of Rewardful at Podia: it’s what we use for our own affiliate program. 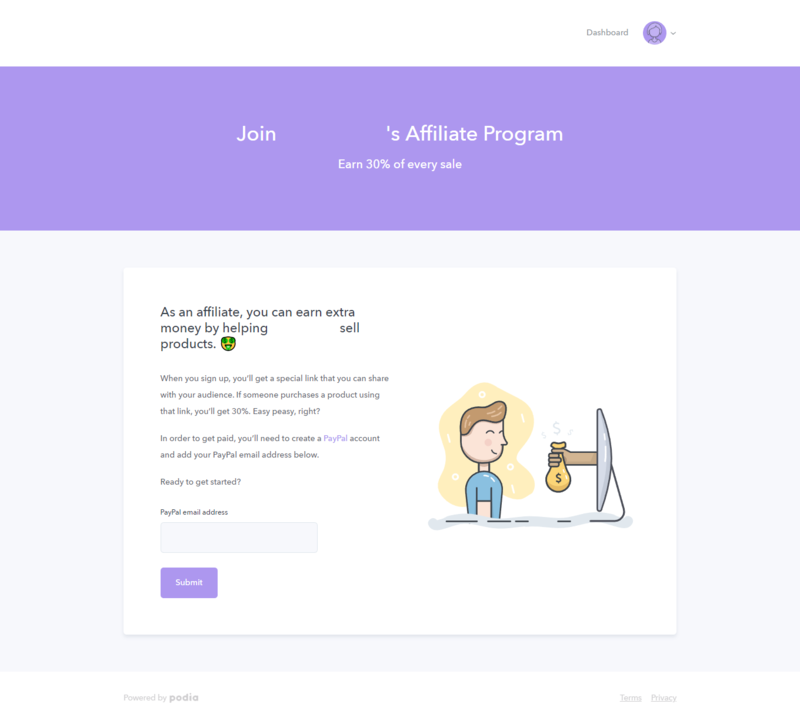 Featuring a super simple (and stunning) user interface, Rewardful makes it easy to set up your own affiliate program and includes integration with Stripe. Did I mention my favorite part? You can get started for free with the “performance” package. Of course, if you’d prefer to do things the super easy way, you could manage your affiliate program directly from where you manage your sales: on your Podia dashboard. Available with our Shaker plan, you can set up your affiliate program in seconds and start tracking your sales just as fast. Plus, you get tons of other cool benefits like our awesome membership software. Let’s take it for a quick spin now. Log in to your Podia dashboard to get started. Click on the small white arrow beside your name in the upper right-hand corner. In the drop-down menu, select “affiliates”. You can also access this page by following this link. Now, set your commission rate. Are you going to allocate a percentage of the sale or a flat rate? 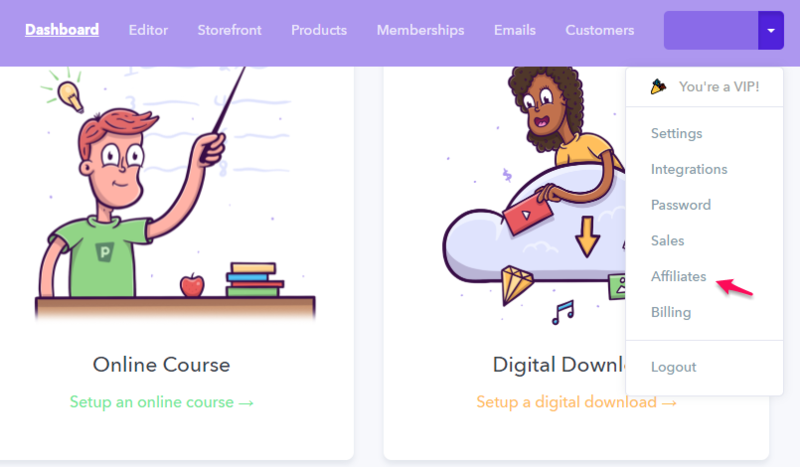 Education affiliate rates typically run at 20%, while SaaS companies -- which your business falls into if you sell digital downloads -- run up to 30%. Refer back to the first section of this article for more factors if you’re unsure about your rate. And that’s it! From here, you don’t need to worry about any additional installs. All of your sales and affiliates will be tracked from this page. 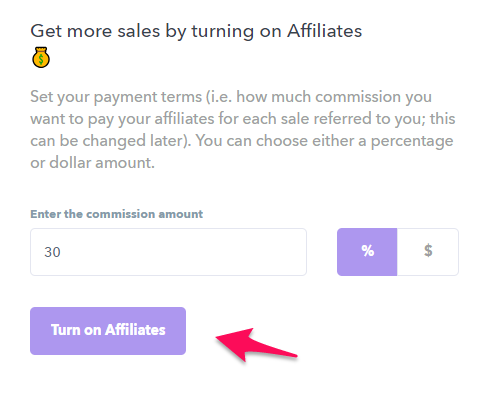 If you ever want to change your commission rate, click “affiliate settings” in the top right corner to enter a new percentage or dollar amount. 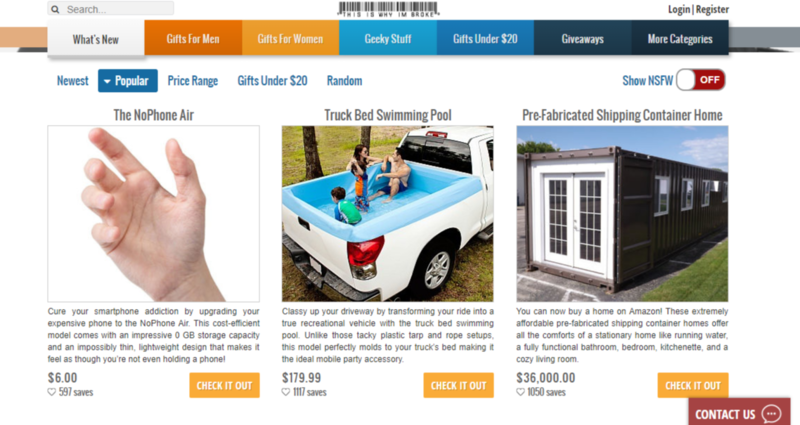 Now, your customers can join your affiliate program directly from their product pages or your storefront. Here’s what it’ll look like from their side. After clicking on “Affiliate,” they’ll be taken to the signup page. It’ll come pre-populated with the email they used to sign up for your product. All they need to do is sign up with their PayPal address, and they’ll get a special link they can share to start selling on your behalf. It’s not just easy for the affiliate, either. Payouts are linked directly to your Podia-integrated pay accounts so that you can pay commissions with the click of a button. What can we say? We really like easy. Which leaves us with just two questions to cover now: how do you start building up your affiliates and get them to promote you? How do I recruit affiliates? If you’re part of an affiliate network, a lot of this will be taken care of for you. But it’s still worth recruiting your own affiliates, and there are a ton of simple ways to build up your network. The easiest method is to find them through organic search. Here’s what I mean. 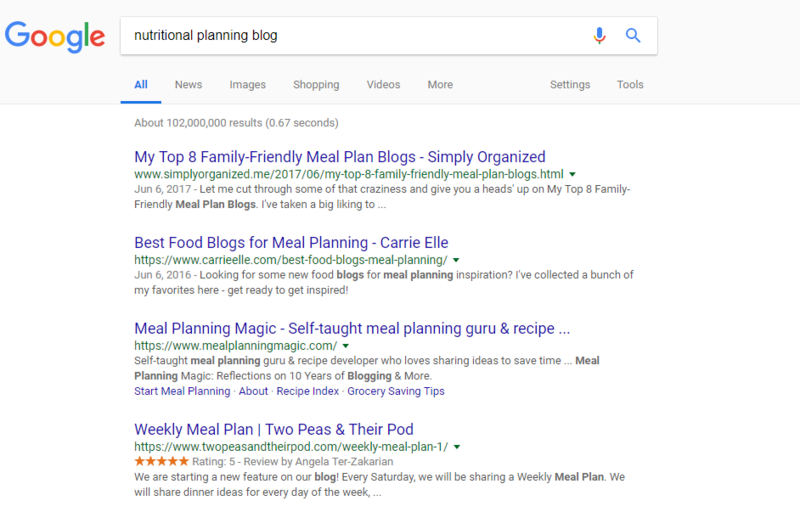 Let’s take a subject area -- nutritional planning -- and then search for top-ranking blogs. Since they’re topping the organic search result list, we know they’re probably pretty good at SEO and have some visitor clout that can translate into a good affiliate conversion rate. Let’s start clicking through and looking for contact pages. The top result already has a contact form setup for partnerships. Nice. Let’s head over to her contact form. From here, it’s just a matter of reaching out with a quick, polite email to see if she’d be interested in joining our affiliate program. Obviously, our course will need to be in nutritional meal planning and in line with her audience. Hi! I love your [blog/website/etc]. I wanted to invite you to check out my online course on [subject matter]. You can find the link here (insert link). If you like it, I’d love to have you join my affiliate program (link here). 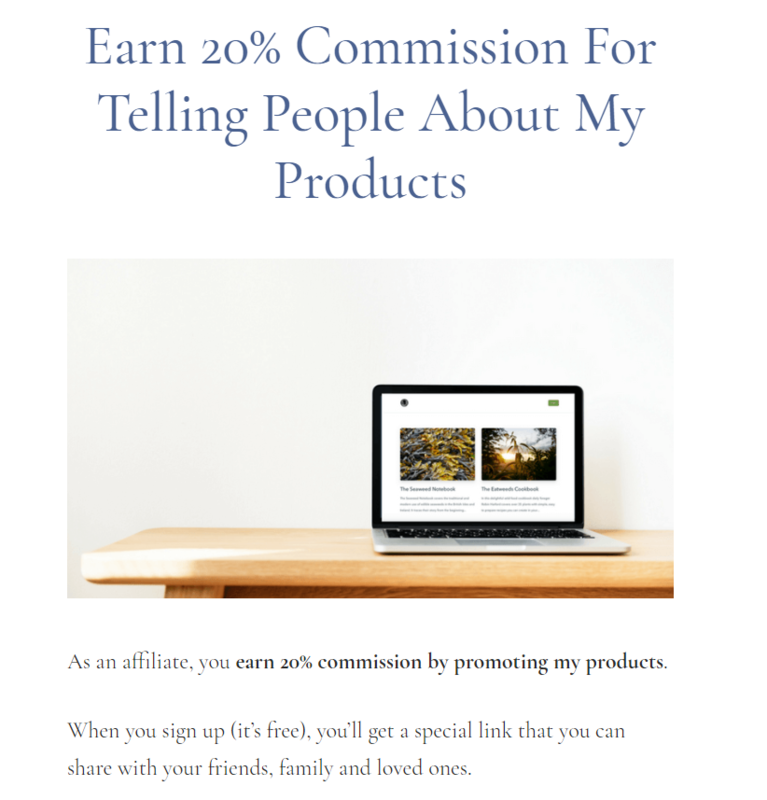 I offer [commission rate] for every sale that an affiliate sends me and feel like we could be great partners. Please reach out if you have any questions or would like to discuss this further. Maybe the blogger bites and reaches out. Maybe they don’t. But in either case, you haven’t lost anything but a few minutes of time for a potentially very lucrative business relationship. Finally, if you want to get as many affiliates as possible, make it simple for them to come to you by holding an open signup page on your website. Check out how course leader Robin Harford presents his here. He opens with a clear value by stating his generous commission rate out of the gate and sets his terms quickly, even capitalizing on the opportunity with a link to an ultra-mini course on how to become an affiliate. Talk about taking things to the next level. 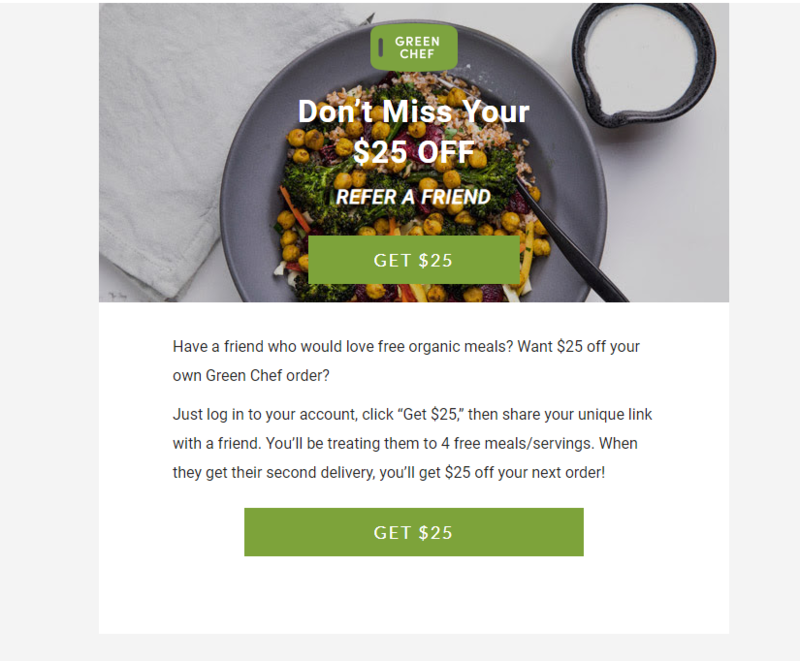 GoodnessMe Box, a healthy, wholefood-focused boutique delivery box company founded by online educator Peta Shulman, takes a slightly more selective approach, upping the competition factor for potential affiliates. Aren’t sure if you should be taking a more selective approach, as well? While they say beggars can’t be choosers, you can never be too cautious when it comes to protecting your brand’s message to customers. By limiting their ambassadors, GoodnessMe Box can keep control over their marketing spend and ensure that any of their official (paid) affiliates align with their values as a business. Needless to say, we’re a big fan of both Robin and Peta’s approaches. For maximum affiliates, use organic search, your current customers and subscribers, and an easy-to-access signup form on your website. How can I get my affiliates to promote me? 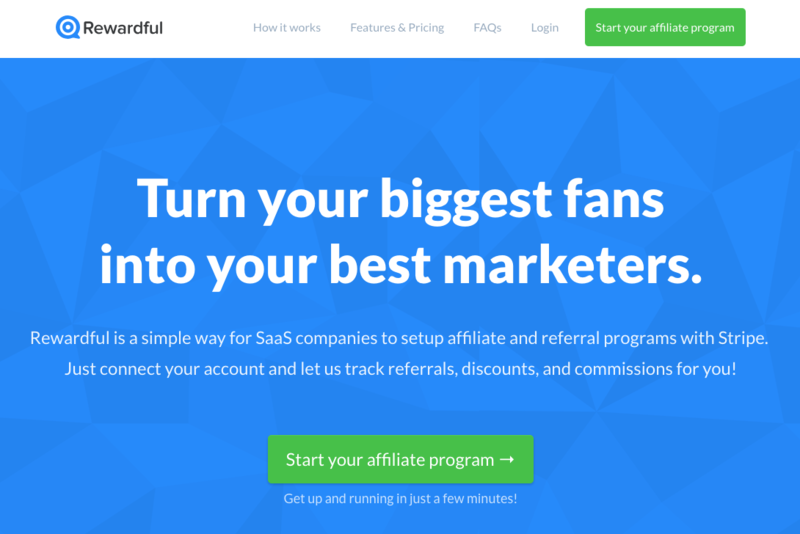 Why are we such big fans of turning customers into your top affiliates? Because satisfied customers become brand advocates, and brand advocates become nigh-unstoppable sales teams. If they’re happy with your product and they’re getting a generous commission rate for being an affiliate, your customers-turned-advocates can rock the foundations of your sales and exert mega-influence on future customers. It’s the same idea behind why customer testimonials are so good for your online course sales. So your first step to getting your affiliates to promote you is an awesome experience with your product (they can’t be advocates if they’re not believers). The second step is a great commission rate. The third is providing them with easy access to creative materials so they can make the case without undue effort on their part. The more assets you can give them, the better. We provide our affiliates with ready-made social media copy, banners, and logos -- they love it. Not only does providing assets make it easier for them to sell on your behalf, the consistency in branding materials helps keep you in customers’ minds by falling into what’s called the “rule of seven” in marketing. 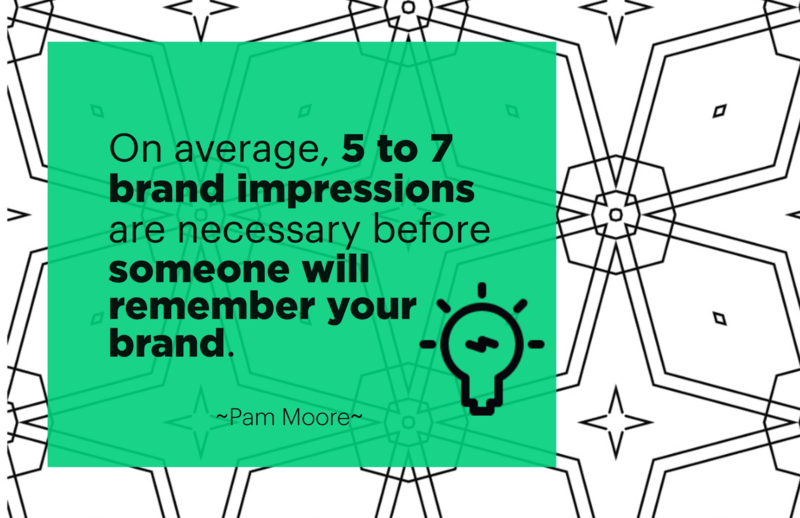 The rule of seven is the prevailing theory that it takes between five to seven impressions of your brand before someone remembers you. If the marketing materials aren’t consistent, it may take even more exposures, so providing materials is a win-win for both affiliate and yourself. Your fourth order of business is to be a reliable affiliate partner, which means keeping your top performing affiliates happy and paying them as quickly as possible. The fifth and final tip to motivate your affiliates is to cultivate a close relationship with them from the start. 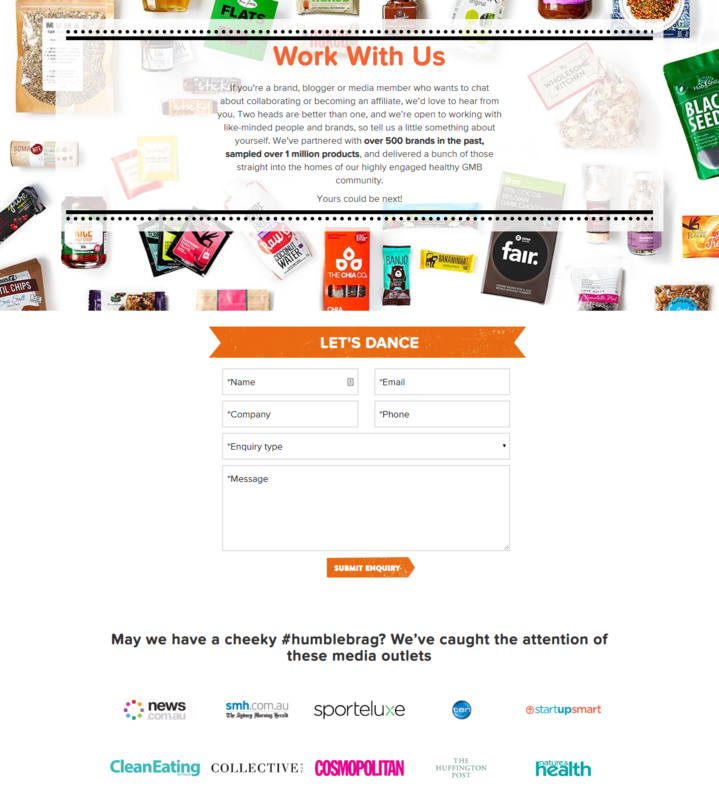 Your affiliates should be excited to promote you, so think of ways to keep them engaged by providing a custom newsletter or running competitions to reward your stand-out affiliates. If a little extra on their part can grow your sales, just imagine what a little extra effort on your part can do. A great affiliate marketing program is a lot like a great friendship. It can be a little nebulous to start out with, but once you get the hang of it, there’s no stopping what you can do with it. At its heart, affiliate marketing is about the people and relationships involved. You, a merchant, cultivate a relationship with a publisher -- your affiliate -- who then brings in new customers for a percentage of the sale. You may be tempted to join an affiliate network, but the costs can be steep, and the loss of control isn’t pretty, either. For smaller businesses, building your own is probably the best bet. 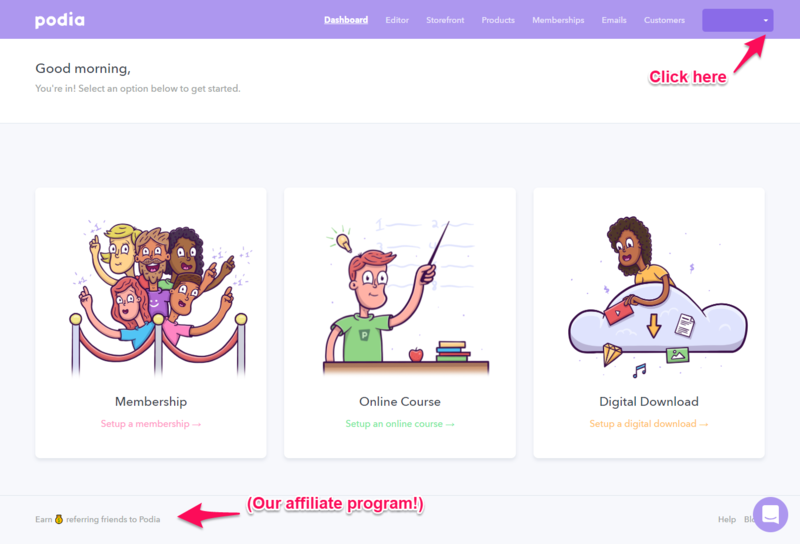 It’s easy to manage your own affiliate program with third-party plugins and tools, but if you want really easy, Podia’s “Shaker” plan makes it a snap. Recruiting affiliates may seem daunting, but a little search work on Google can get you far, and reaching out to your existing customers and subscribers is another quick-win. Make sure your website has an open signup form for maximum results. Finally, motivate your affiliates. In addition to a fair commission rate, help make it easier for affiliates to land a sale by providing creative materials and keeping them excited through custom newsletters, fast payment, and fun (rewarding) contests. They say special friendships can last a lifetime, but I say lucrative affiliate relationships can -- and should -- last just as long. Get started with your first today by trying out our Shaker plan for free.